Even as the country grapples with how to combat a recent spate of mass school shootings, it also must address the much more common gun violence that plagues young people of color, lawmakers and advocates said at a panel discussion Thursday. 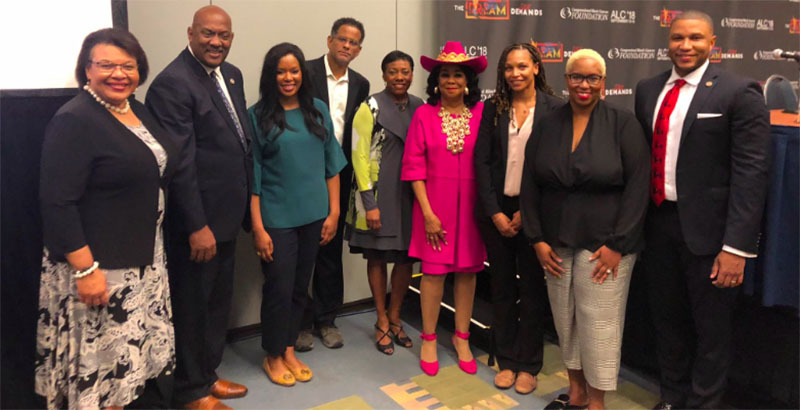 “While devastating tragedies, mass shootings, do require action, we know that every day in our communities, our children are suffering from gun violence,” said Becky Pringle, vice president of the National Education Association. She and others spoke at an NEA-sponsored event on gun violence at the Congressional Black Caucus’s annual legislative conference in Washington, D.C.
Just as the governors of North and South Carolina, Virginia and elsewhere were in front of TV cameras this week declaring states of emergency ahead of the incoming Hurricane Florence, so too should they decree one with gun violence, said Rep. Dwight Evans, Democrat of Pennsylvania. “From a public health perspective, in my view, and in my mind, that’s where we are,” he said. Panelists discussed a variety of interventions to combat gun violence, from formal mentoring programs to wraparound services to more teachers of color. One thing officials shouldn’t do, Pringle said, is try to make schools safer by increasing police presence without considering impacts on students of color and the school-to-prison pipeline. “We also know that if we are not careful and if we are not thoughtful, there will be folks who will rush to make our schools safer by eviscerating the civil rights protections for our students of color and those with disabilities. We cannot, we cannot worsen the racial inequities that already plague our system and result in students of color disproportionately falling victim to zero-tolerance discipline policies that throw them into the school-to-prison pipeline,” she said. The event comes as lawmakers finalized a compromise Thursday on next year’s federal funding bill that Appropriations Committee leaders said does not include a ban on using federal funds to purchase guns or train teachers. The NEA, the National PTA, and others had called on Congress to include language blocking the funding from being used in that way, as it has with other school safety grants. The New York Times first reported last month that Education Secretary Betsy DeVos was considering allowing states to use a catchall $1 billion grant program under the Every Student Succeeds Act, usually known as Title IV, to arm teachers. DeVos has since said, in response to letters from members of Congress, that she wouldn’t issue rules either explicitly allowing or disallowing the funding to be used for guns, permitting states and school districts to make that call themselves. Texas was one of the states that asked the Education Department about whether the money could be used for that purpose, although officials in districts there that do arm teachers said this week they wouldn’t put federal funds toward firearm purchases because of the liability and paperwork involved.